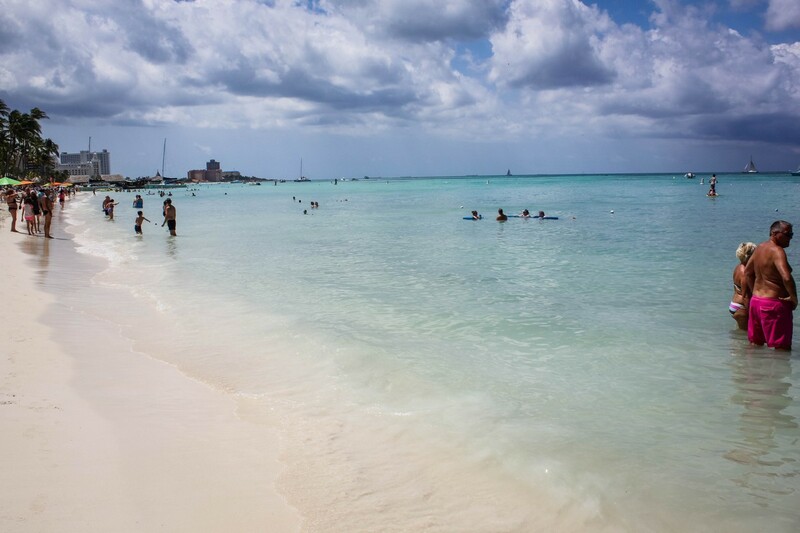 The island of Aruba is well known for its perfect weather and even prettier beaches. 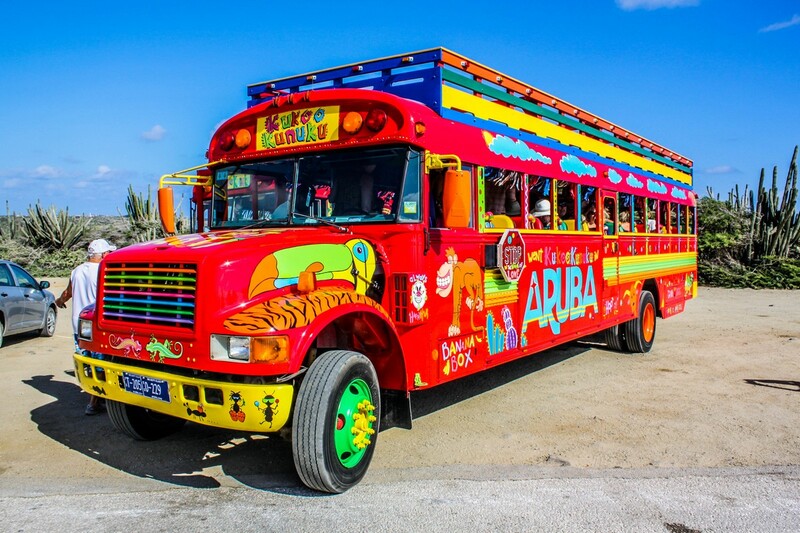 For many Royal Caribbean guests, visiting Aruba might be a one-time opportunity, and for those that want to see some of the cultural and natural highlights of the island, while cruising in an over-the-top fun bus, then the Kukoo Kunuku Palm Beach Tour might be just right for you. 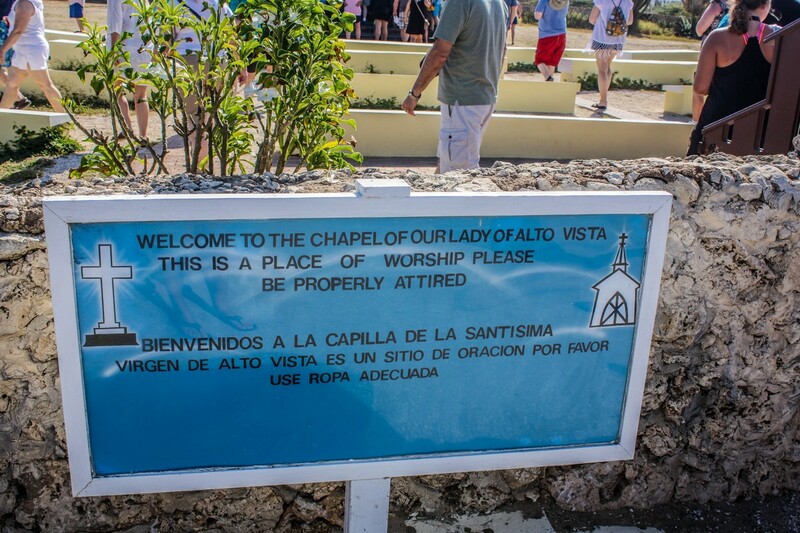 While in Aruba on port stop onboard Navigator of the Seas, we tried out this colorful tour of Aruba to see what it is like to explore Aruba while singing at the top of your lungs. 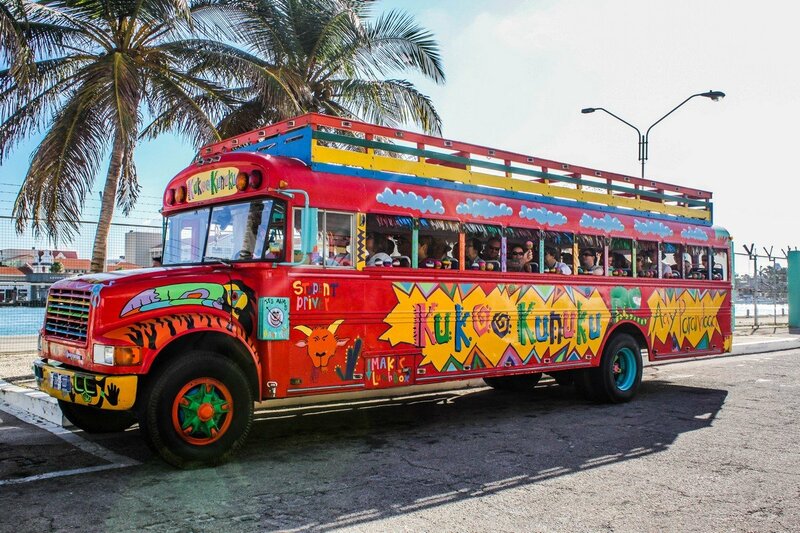 Kukoo Kunuku is a local tour company that provides bus tours of Aruba that visit some of the island's best known spots. 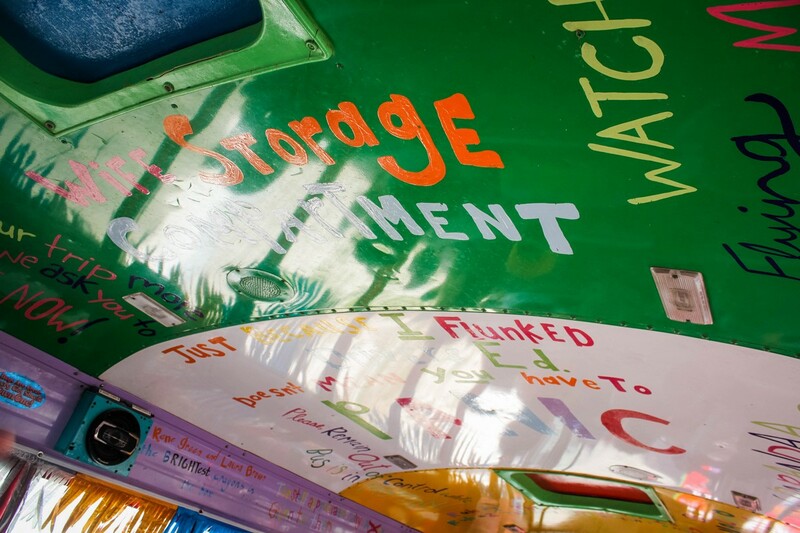 While bus tours tend to be very similar experiences (pile in, go to a spot, pile out, take photos and pile back in, repeat), the folks at Kukoo Kunuku wanted to really change it up. 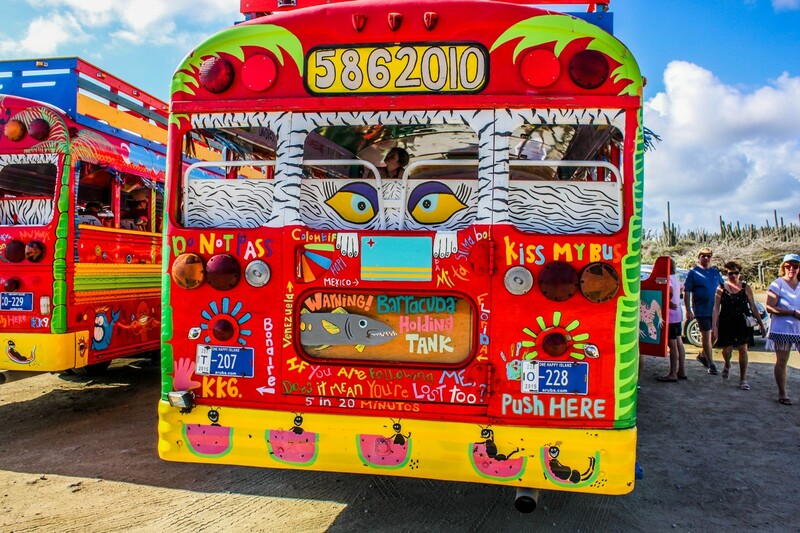 They took old school buses, painted them all sorts of colors, plastered a ton of funny sayings and metaphors all over the bus, added maracas and blast classic sing-along songs to enjoy as you explore Aruba. Guests climb aboard the bus (there were three in our tour), and are quickly indoctrinated into the Kukoo Kunuku culture of singing, being loud, and trying to "scare" any bicyclist or person on the street you pass by with hoot and hollering. 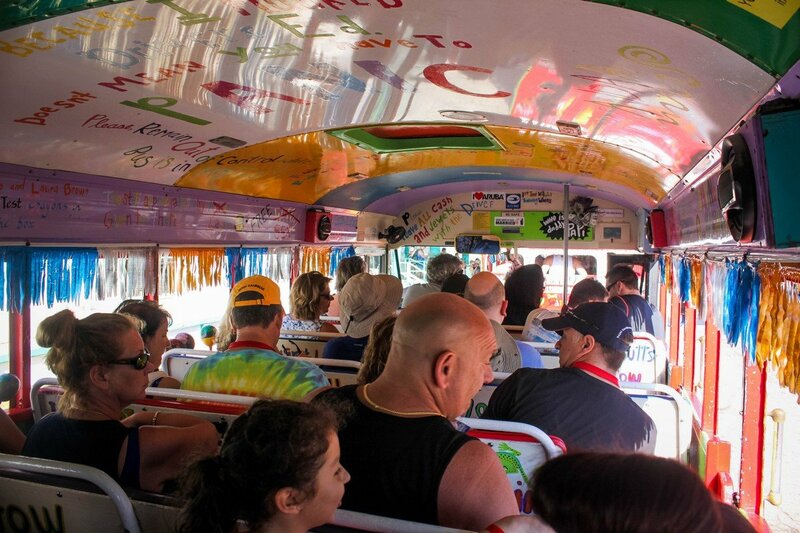 The tour is as much about the experience onboard the bus as it is the places you visit. 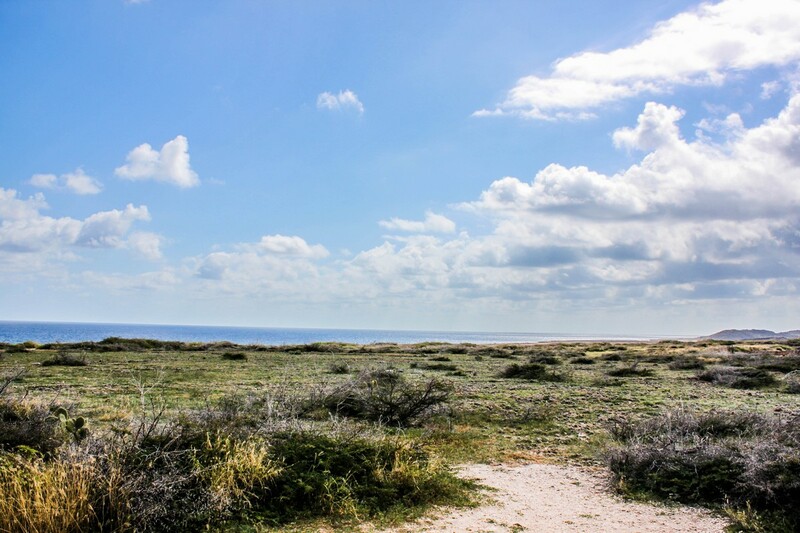 The Kukoo Kunuku tour visits three spots, but begins with a general tour of Aruba that includes back story of the island and many opportunities to see what life is like in Aruba. 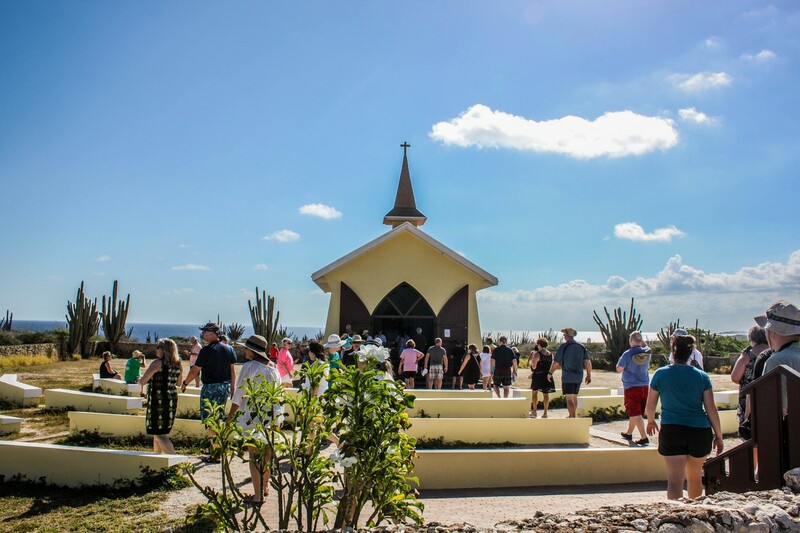 The first stop is at Alto Vista Chapel, which is a small Catholic chapel that stands on the hills above the north shore of the sea. It is a beautiful spot that provides some lovely views all around. Back in the bus, the next stop is the California Lighthouse. 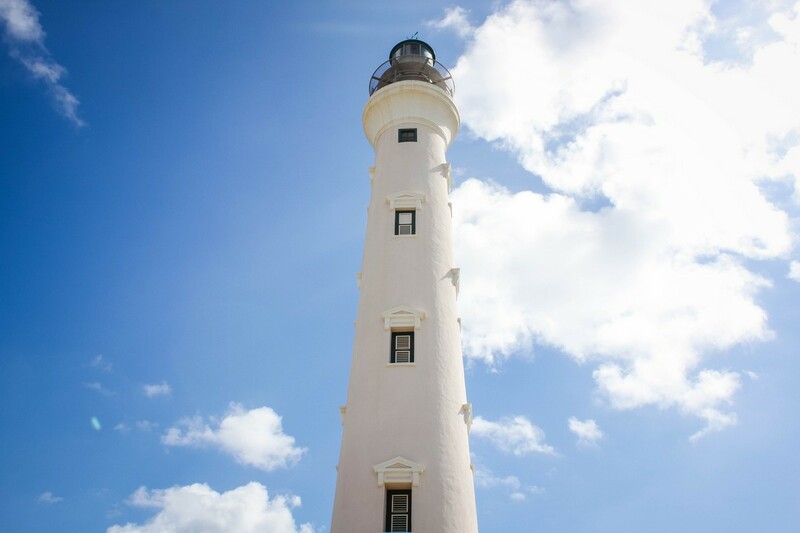 The lighthouse was named for a ship that wrecked nearby Aruba in the 19th century. Guests may not climb to the top of the lighthouse, but like the chapel, the spot provides an excellent vantage point of the surroundings. The final stop, and bulk of your time in the excursion, is a stop at Palm Beach. 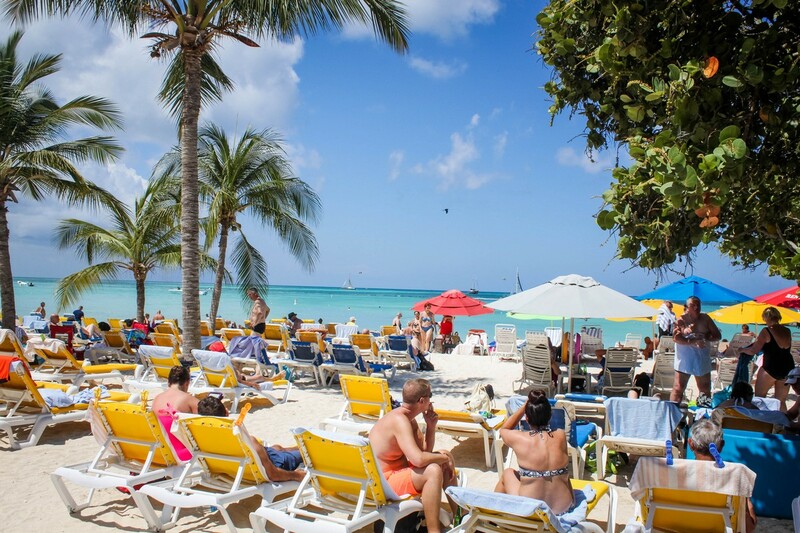 Palm Beach is one of the two most popular beaches in Aruba (along with Eagle Beach) and the excursion includes the use of a complimentary beach chair. There is food and drink service provided at the beach for an additional fee. The tour concludes with a fun trip back to the port area, with a good look at the beaches along the way. Kukoo Kunuku is one of those excursions you have to experience for yourself to truly understand what it offers. It is more than a typical bus tour, and the fact we were traveling with many friends in a large group made for an even better time onboard. The tour's approach to encouraging everyone to sing along to classic rock songs set the tone a very fun day. The driver of each bus serves as your guide, and will talk about various sights you will see along the way. The tour takes you through the interior of Aruba to begin with, and then concludes with a ride down the coast on the way back. The tour culminates with a beach stop at one part of Palm Beach. Unfortunately during our visit, the beach was quite packed by the time we arrived. Personally, I prefer a spot on the beach with shade (my days of seeking a bronzed look are well past me), and there just was nothing to be found. There were umbrellas for rent, but they were sold out. We ended up sitting at a picnic table underneath a few trees and that served the purpose just fine (plus I had great bar service). I definitely would have preferred either a less crowded part of the beach, or a beach with more shade options. All that being said, we ended up having a nice time once we got settled in. I was skeptical about the zany nature of the tour, but by the end of the 4 hour excursion, I was wanting more. From singing along to great songs to speeding around traffic circles multiple times, the tour ended up being a lot of fun. Ultimately, what sets Kukoo Kunuku apart from other tours is the fun you have onboard the bus. From the moment you sit down, you will notice this is not your typical tour. Groups, families and anyone who kind of knows a few people on the tour will really enjoy this opportunity to explore Aruba while having a great time. The low cost of the tour (just $34 per adult) made getting a taste of Aruba just what we needed. Cost: $34.00 per adult or $19.00 per child. Infants are free. Our friend Don from EatSleepCruise.com is back again today, with a look at a great Southern Caribbean port, Aruba. Enjoy! Aruba is a popular vacation spot welcoming over half a million cruise ship passengers each year. Many popular cruise lines have itineraries that visit Aruba, including Royal Caribbean’s Adventure of the Seas. Located just 15 miles north of Venezuela, this Southern Caribbean island is truly one of a kind. Measuring only about 6 miles wide and about 20 miles long, you can see much of the island in a single visit. Recently, we sailed on Adventure of the Seas, and our itinerary was altered resulting in an impromptu stop at this “one happy island”. After spending a full day exploring the island, we are already looking to return on another cruise. If you want to know why we are so eager to get back to Aruba, our Top 10 Reasons Why You Should Visit Aruba may have you booking your own trip to the island. While the Caribbean is known for having great weather, Aruba might just be the ideal vacation spot. Getting only 18 inches of rain a year and having constant temperatures between 80 and 90 degrees, you are almost guaranteed perfect weather. Situated just 12 degrees north of the Equator, the island is located south of the hurricane belt, and only rarely experiences the effects of tropical storms. In addition, the favorable trade winds make the feel-like temperatures tolerable; so, as long as you wear plenty of sunscreen, you can enjoy a full day in the sun. While there is plenty to do while on the island, take some time to appreciate the magnificent views from both sides of the island. In the southeastern Arikok National Park, you can get a bird’s eye view of the island from atop the Arikok Hilltop. If you head to the Casibari Rock Formation, you can reportedly see the coastline of Venezuela on a clear day (which is only 15 miles away). 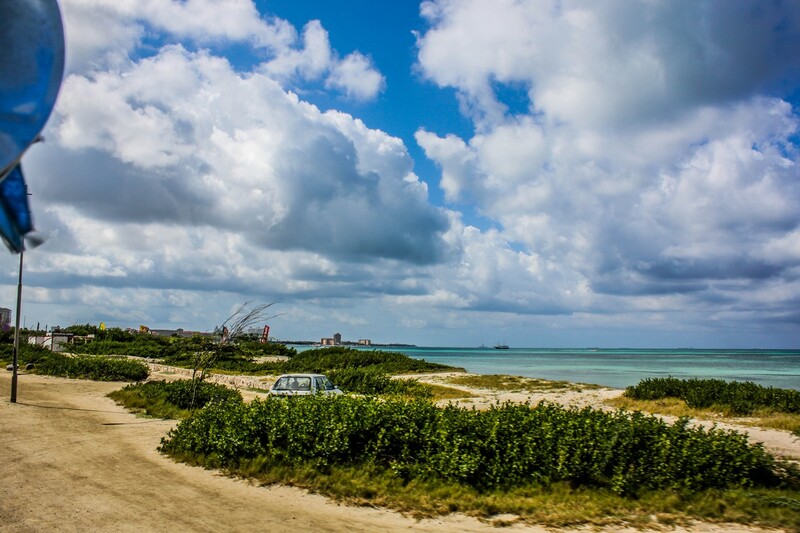 On the island’s northern tip, you can climb the hillside in the area known as “Hudishibana” to get fantastic views of both the rocky coral shoreline to the east and the white sandy beaches to the west, as well as the Championship Golf Course, the Tierra del Sol. There’s also plenty of grown-up fun to be had for those who want to escape the beach while in Aruba. Tons of bars and nightclubs, restaurants, and shopping can be found in the northern hotel district. You will find many familiar retail outlets, international cuisine, and upscale hotels resorts, like the Ritz Carlton Aruba. You can explore this area on foot, do a little shopping, or press your luck at one of the dozens of casinos found in virtually every resort. You may also want to enjoy a full day of pampering with a day pass, including food and drinks, at the luxurious 5-star Occidental Grand Aruba where you can use the beach, pools, water sports, and other resort facilities. Now a Dutch colony, Aruba has a checkered past with its native Indian roots and influences from various European settlers. 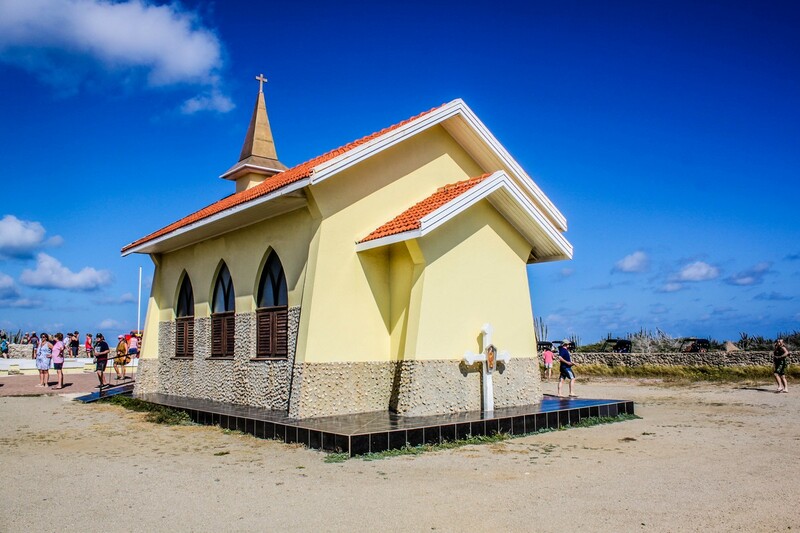 Discover this heritage by visiting various historic buildings during your visit to Aruba. 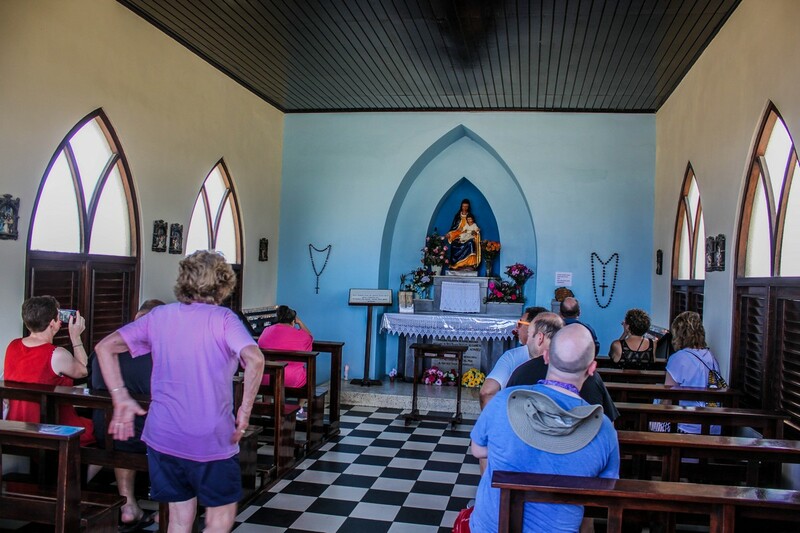 Among the locations on your tour, one should be the Alta Vista Chapel, the oldest church on the island dating back to the 1750s. For more excitement, you can relive the Aruban gold rush of the mid to late 19th century, in which 3 million pounds of gold were excavated from the island, by visiting the Bushirbana Gold Mill Ruins. This 140 year old smelting plant was built to resemble a fortress to ward off pirates. There is also the famous California Lighthouse. This 100 year old lighthouse was built after a steamship sank off the northern coast of the island and now provides stunning vistas of the surrounding areas. Indulge in some of the best restaurants in the Caribbean while you are docked in Aruba. You can dine in one of the first restaurants to make eating on the beach popular in Aruba, the Flying Fishbone, with its Mediterranean inspired menu. For more adventurous palates, there are several “chef’s table” options providing intimate 4 and 5 course meals at trendy locations like the 2 Fools and a Bull and the popular Carte Blanche, For families, Gostoso offers a casual atmosphere and a menu with traditional Aruban dishes with Portuguese influences. 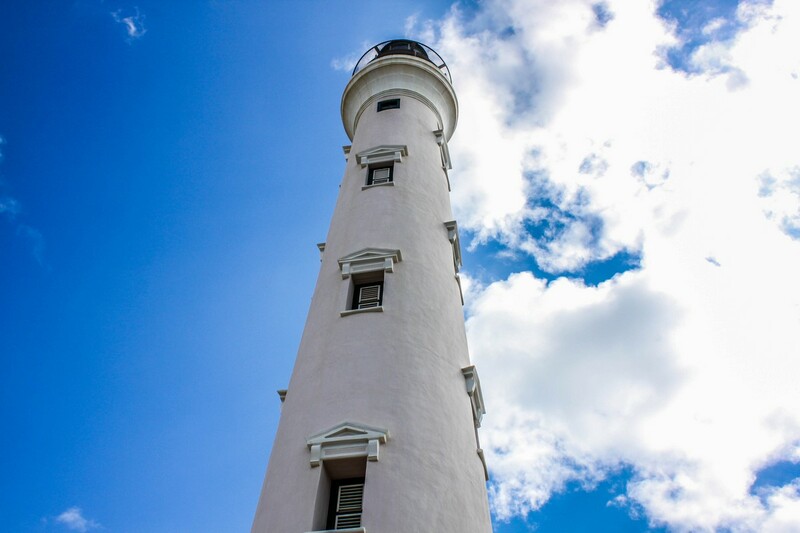 There is also the well-known La Trattoria El Faro Blanco, located right near the California Lighthouse. Famous Italian dishes are served in both indoor and outdoor dining rooms offering spectaculars views of the coast and the perfect romantic dinner location. Unique to Aruba are two Rock Formation sites. The Casibari Rock Formation, toward the middle of the island, is a cluster of huge tonalite rocks. Appearing to just rise from the ground, you can take the 55 step climb to the top of these boulders for a great photo op. Walking paths also exist around the formation to let visitors wander the adjacent large rocks and other landscapes near the site. After your trek, you can get a drink at Casibari Café and perhaps listen to some of the live music. Further east on the island is the Ayo Rock Formation. These diorite rocks were utilized by the native Arawak people for ceremonies and tribal rituals. Ancient cave paintings and carvings dating back thousands of years can be seen in some of the formations. These large boulders seem like they have been purposely placed next to each other in unique designs. Travelers can transverse this area at their own risk. Unlike your traditional Caribbean islands, with palm trees and lush green vegetation, Aruba offers a quite different landscape. It is mostly a flat, arid, desert with little vegetation. You will find several species of cacti that have various uses including fences for keeping out livestock, cooking (the tall Kadushi Cactus is used for making soup), and even Christmas decorations. 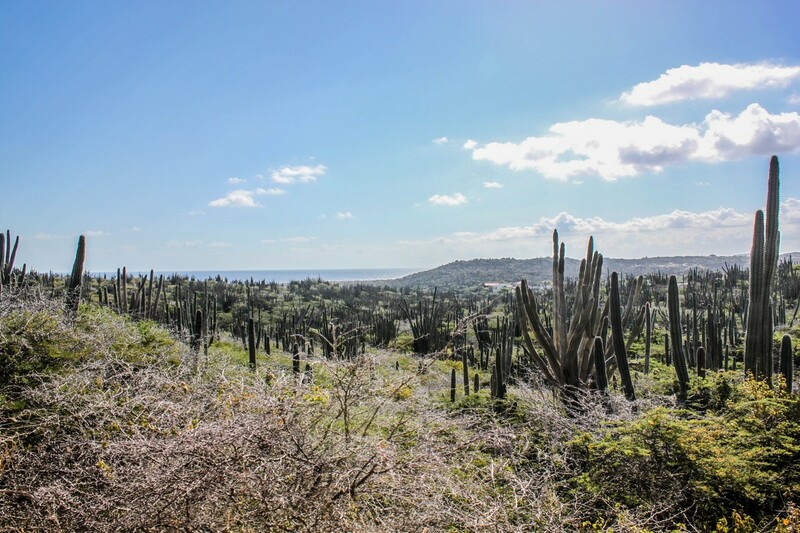 After admiring the cacti, you can let the awe inspiring divi-divi trees be your guide, literally, as the constant eastern breeze has shaped these trees to all point in the southwest direction. Aruba appears to be one of the few locations in the world where these trees thrive, so make sure your camera is fully charged to capture this unique landscape. Although they are not native to Aruba, donkeys have played an important role in the Aruban economy for close to 500 years. With the influx of cars on the island, donkeys were nearing extinction until the 1970s when the non-profit Donkey Sanctuary was founded. Visit the sanctuary to learn more about these animals and help support their preservation. You can also take time to learn more about the mysterious ostrich at the Ostrich Farm on the eastern coast. Interact with over 80 ostriches and emus as guides provide details about the largest living bird species on earth. Or, you can explore the Butterfly Farm in Aruba, providing you the opportunity to view 100s of different butterfly and moth species. A guided tour comes included with your admission, and it is recommended that you arrive early when butterflies are more active. If the natural landscape and rock formations are not tantalizing enough, then Aruba’s famous natural water attractions may have you calling your travel agent. The most famous of these sites is the island’s Natural Bridge, a 25 foot high and 100 foot long bridge made of coral limestone. Even though it partially collapsed in 2005, it is still a popular tourist stop and amazing photo opportunity. For more adventurous swimmers, the Natural Pool (or Conchi) in Arikok National Park is surrounded by rigid rocks and offers excellent snorkeling and scuba diving. The terrain is rocky so getting to this natural pool requires 4X4 transportation or horseback. Many Caribbean islands are known for their beaches, but of all the islands we have visited, Aruba by far has the most pristine beaches of any island in our opinion. We relaxed on Eagle Beach during our visit, the widest beach on the island. The white sandy beach and crystal clear water was pure paradise! This public beach is free to all visitors, and you can rent chairs from seaside vendors. 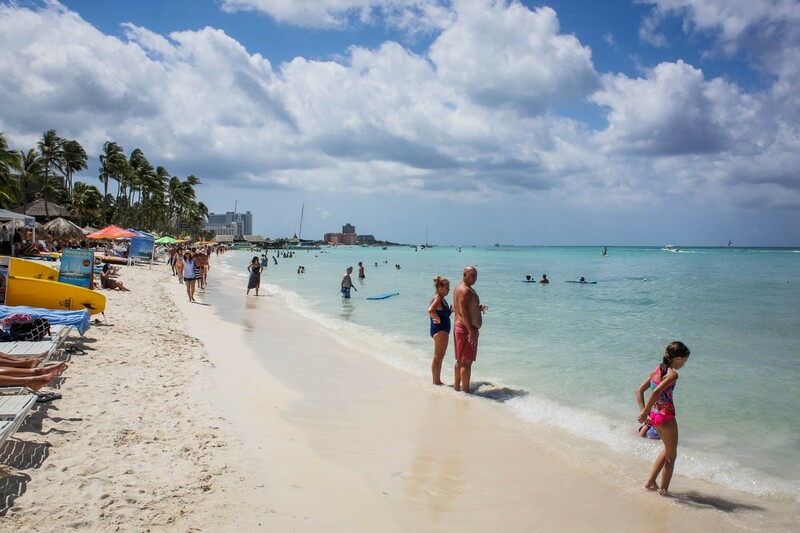 On the southern tip of Aruba is the famous Baby Beach, this lagoon beach has shallow water making it the perfect stop for families. The calm waters within the lagoon also provide ample opportunity for snorkelers of all skill levels. If you like your beach break with a little more energy and excitement, then Palm Beach is your destination. This two mile stretch is adjacent to the hotel district with bars, restaurants, and a variety of water sports. We have only scratched the surface on things you can do and see while in Aruba, but I’m sure you can already see why we can’t wait to plan another cruise stopping at the island. Aruba truly has a variety of attractions, entertainment, and Caribbean life making it one of our favorite ports of call. So the only question remaining is “When is MY next trip to Aruba?”.